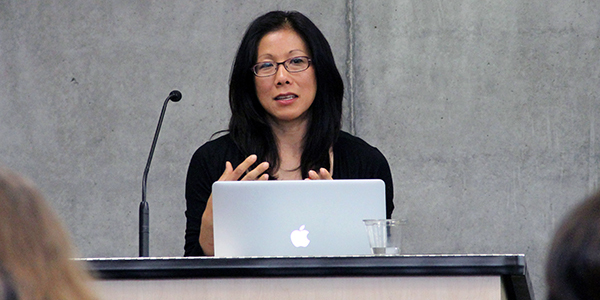 Mimi Ito speaks to students at UC Irvine. (IRVINE, CA) — Connected learning, a way to approach education in the 21st century that takes advantage of today’s abundance of information and social connection, is getting a big boost of support through a $4.9 million grant. Funded by the John D. and Catherine T. MacArthur Foundation’s Digital Media and Learning initiative, the grant has been awarded to continue the work of the Connected Learning Research Network (CLRN). The Network, based at UC Irvine, includes researchers at institutions across the country and in the United Kingdom. Since 2011, CLRN’s scholars have been advancing the emerging field of digital media and learning through interdisciplinary research. Over the next four years, the grant funds the CLRN’s next phase, in which the researchers will test and refine the theoretical framework for connected learning by establishing a series of projects that examine how, when implemented, connected learning might advance successful preparation for college, work and civic engagement. Well-supported learners — a privileged minority — are using today’s social, interactive and online media to magnify their learning and opportunity, said Ito, a cultural anthropologist who also serves as the MacArthur Foundation Chair in Digital Media and Learning and is a UC Irvine Professor in Residence. More information on connected learning and the CLRN is available online. Affiliated with the University of California’s Humanities Research Institute at UC Irvine, the Digital Media and Learning Research Hub is dedicated to analyzing and interpreting the impact of the Internet and digital media on education and civic engagement. Its primary emphasis is on connected learning and emergent political practices — participatory politics — as well as initiatives such as connectedlearning.tv, make-to-learn, and alternative credentialing (i.e., badges for learning). All its work, including original research, websites, publications, workshops and an annual conference, is supported by the John D. and Catherine T. MacArthur Foundation. The John D. and Catherine T. MacArthur Foundation supports creative people and effective institutions committed to building a more just, verdant and peaceful world. In addition to selecting the MacArthur Fellows, the Foundation works to defend human rights, advance global conservation and security, make cities better places, and understand how technology is affecting children and society. Banner image: Mizuko (Mimi) Ito delivering a talk on connected learning at UC Irvine.